The 10-part docu-soap, filmed in Borneo, Indonesia, takes viewers inside the intimate and emotional journey of baby orangutans, and their caregivers, at the world's largest primate rescue and rehabilitation project managed by the Borneo Orangutan Survival Foundation (BOSF). Blue Ant International oversees licensing of Orangutan Jungle School and will feature the docu-soap at MIPTV 2018. 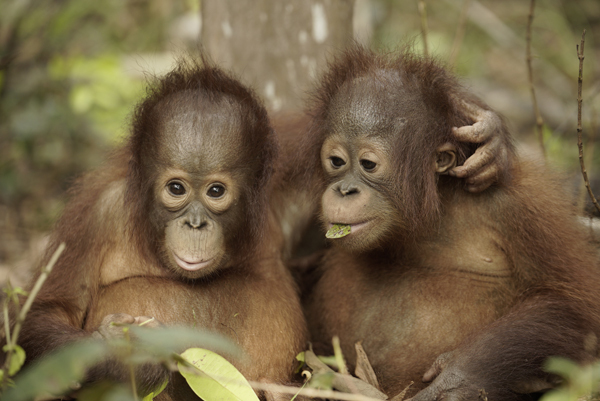 Nursery school students, Jacqui and Bumi (L-R), star in Orangutan Jungle School (10x60’;HDR), produced by NHNZ for Love Nature and scheduled for delivery in June 2018. NHNZ, Blue Ant Media’s New Zealand-based factual television production house creating original content for global broadcasters, announced today that it is currently in production on a new HDR natural history docu-soap, Orangutan Jungle School (10x60’HDR). Commissioned for Love Nature, home to the largest 4K wildlife and nature library in the world, Orangutan Jungle School follows the hilarious antics, triumphs and tragedies of a group of orphaned orangutans as they progress through a unique forest school system. The series is filmed at Nyaru Menteng, in Borneo, Indonesia, where the Borneo Orangutan Survival Foundation (BOSF) manages the largest primate rescue and rehabilitation project in the world. Blue Ant International oversees the docu-soap’s licensing, which will be featured at MIPTV 2018. “The individual storylines and overarching narrative of this series is comparable to anyone’s favourite long-running drama soap. The scope of material for our production team is a banquet of delights including edge-of-seat drama, tear-jerking moments and plenty of comic relief. The orangutans themselves take over the script development and come up with stories we would never even think of,” said Judith Curran, Writer and Executive Producer. In the jungle classroom, lessons range from cracking open a coconut to nest building, snake awareness and how to become an expert climber. The youngest students are less than one year old and the oldest are the equivalent of human teenagers. Adolescent and adult graduates wait their turn for wild release on special river islands. Valentino: the class clown who BOSF carers hope will smarten up enough to graduate. Mema: a picky eater who thinks snack time is gross. Malika: the clumsy toddler who doesn’t know how to climb. Big-bellied Beni: the glutton who has to go on a diet. Kesi: the inspiring amputee victim whose hand was cut off by a machete as she clung to her mother’s back. Nothing stands in her way and she’s always at the top of her class, even in climbing! Cinta: one of Jungle School’s cleverest, boldest and most resourceful students. She is full of surprises!